Low back pain is a serious issue for professional and amateur golfers alike. Research studies have shown that low back pain accounts for 18-54% of all golf injuries, depending on which study you read. The golf swing places a tremendous amount of stress on the low back (lumbar spine) combining end-range rotational range of motion at high velocity repeated over and over again over a long period of time. This is a recipe for back pain. Although low back pain is a serious and potentially debilitating condition, it is by no means a "death sentence" to your golf game. Since golf is a repetitive asymmetrical rotational sport, the forces on the spine and surrounding tissue are not evenly distributed between the right and left side. According to a study by Sugaya et al, low back pain and injury typically occurred on the trail side of the lumbar spine. These injuries are usually due to compression of tissues on the trail side of the body and impact when you and in right sidebending and moving into left rotation. This means that for a right handed golfer, low back pain symptoms are typically felt on the right side of the low back. Given that swinging a golf club places tremendous amounts of stress on the lumbar spine, I want to address the eight major factors for low back pain in golfers and what common swing faults we see in golfers with these sub-optimal qualities and how this can perpetuate low back pain in golfers. This one is logical: previously having acute or chronic low back pain is the number one risk factor for developing low back pain while golfing. In a study of almost 200 novice golfers, aorund 25% of them experienced low back pain during their first season playing. However, the majority of these players did not feel like golf was the cause of their low back pain. Rather, the study explains the players felt that golf had exaccerbated their symptoms of low back pain which they had previously experienced. Interesting. It seems logical that the 8x body weight compression force on the lumbar spine during each full effort swing could cause a recurrence of previous low back pain. In a 2010 study by Tsai et al, the authors examined the differences in biomechanics of the golf swing between golfers with low back pain and golfers without low back pain. The study concluded that golfers WITH low back pain demonstrated significantly less hip extensor strength, decreased lead side (left) hip abductor muscle strength, and limited trunk rotation to the trail side (right). These are all characteristics in the golf swing that can increase stress on the low back, potentially perpetuating their low back pain and impairing performance. This seems to be a common theme among athletes that I work with who play many different sports: too much of a good thing is bad. This is true whether it's baseball players who pitch over 150 innings a year, gymnasts who practice and compete all year round, or powerlifters who never take a deload week. The body needs time to rest, recover, and get stronger in order to avoid injury. Research shows that golfers who practice more often and for a longer duration are more likely to sustain an overuse injury. I like the use two concepts of quantifying and measuring overuse in sport when I am educating a golfer on why too much golf can be harmful: The Cumulative Load Theory and The Acute-Chronic Workload Ratio. "In golf, the combination of large magnitude spinal forces combined with a high frequency of swing repetitions, likely results in lower back injury over time through the cumulative load process. The influence of cumulative load on golf-related LBP is likely why elite players identify overuse rather than a traumatic event as the cause of their LBP." Tim Gabbet is credited with developing this theory to explain why overuse injuries happen. Essentially, this theory defines chronic workload as "what your body is used to doing" and acute workload as "what your body is doing today." If what you are doing today is a dramatic increase in activity compared to what your body is used to doing, the risk of injury increases. My recommendation is to begin each golf season by easing into practice sessions, gradually increasing your swinging volume over a period of time to build up a solid foundation. Limiting the amount of abrupt spikes in golf swing volume will help to lessen the risk of injury throughout a season. Also, maintaining an appropriate strength and conditioning program while playing golf can help to build resiliency and decrease the risk of injury. We've all heard the saying, "It's all in the hips," and it's certainly true in golf. The lower half serves to generate power through the kinematic sequence of the golf swing through channeling and using the ground reaction forces to transmit power from your feet to the club. The legs generate power, the trunk and arms transmits the power, and the club exerts the power on the golf ball. Poor lumbopelvic control can manifest itself in numerous phases of the golf swing. Golfers who have difficulty controlling pelvic positioning will often have a sub-optimal address position, inefficient kinematic sequence, and potentially a number of different major swing faults. Each of these issues has the potential to place a greater stress on the lower back during each swing. When I work with a golfer who struggles with poor lumbopelvic control in their golf posture, I often find that other culprits of low back pain on this list are present as well. These can typically include general weakness of the core, glutes, and leg muscles, limited hip mobility, and limited trunk rotational mobility. It is important to recognize that although these are distinct characteristics on this list, some or all of them may be present in golfers who have ever experienced low back pain. Weakness of the abdominal muscles, hip extensor muscles, and hip abductor muscles have long been correlated with low back pain. The abdominal muscles should be contracting during the downswing and through impact to create a stable foundation for rotation of the upper body. If a golfer has weakness or poor endurance of the abdominal muscles, over the course of a round a golfer may begin to lose some stiffness through the core. Once this happens, the golfer is losing a lot of stability in their swing which can predispose them to placing more stress on the lumbar spine. The same thing occurs with the poweful muscles of the hips and lower body. If these muscles aren't generating the power in the swing, golfers will attempt to generate this power elsewhere. It is well documented in the research that prolonged periods of sitting and relative inactivity can have an impact on posture and muscle strength. Im going to stereotype the typical golfer that I work with: 30-55 years old, works a desk job 40-80 hours each week, doesn't go to the gym as much as he or she wants, and has nagging aches and pains in various areas. Their physical screen reveals weakness and decreased endurance of the core and lower body muscles, and poor motor patterning in movements related to their golf swing. This same person then picks up a golf club Saturday and Sunday morning and plays 18 holes of golf. On Monday, they have significant soreness and discomfort in their low back. Now, this is definitely not the only scenario of people that I treat for golf-related low back pain. I would say, however, that it is unfortunately the majority of golfers that I see. The notion that golfers are weak and out of shape has been completely thrown out the window in professional golf. Golfers need to be strong enough to handle the extreme forces the golf swing places on the body. They also need to have the endurance to use that strength over 4+ hours of repeated swinging. I strongly advocate that golfers get into a solid strength and conditioning routine that focusing on general strength, rotational power development, and overall fitness. Stay tuned for the second part of my post on 8 Reasons Why Golfers Have Low Back Pain: Part 2. In the second part, I will talk more specifically about certain characteristics of a golfer's physical limitations and how they correlate with major swing faults. Thank you to the teams that completed rounds 1 & 2 before the 1/27 deadline. It has been awesome to observe the different strategies and team work that our participants have displayed thus far. For those of you that have not completed your required rounds, our staff understands that this is a very busy time of the year for everyone and life can get in the way, but please remember your commitments to this league. Now, on to the fun part…. Congratulations to the team of Alex Leifer and Evan Milstein who hold a Round 2 lead of -28! Close on their heels at only two shots back (at -26) is the team of Andrew Hackett and Josh Filz. There are two teams holding strong at -22 and three other teams at -20. Do not let some of these early low scores scare any of you, as there is a lot of golf left to play! The Leader Board (below) is only comprised of teams that have completed Rounds 1 and 2. Please give us a call if you have completed both your rounds and do not see your name on the Leader Board. We do our best to record all scores but at times the facility gets extremely busy and we may have missed your submission. Thanks again for your participation in the Winter League! The 2/10 deadline for rounds 3 and 4 is fast approaching, so please remember to book your simulator rentals in advance. The TrackMan Combine is a 60 shot standardized test that allows you to find your strengths and weaknesses in your game. The yardages that are covered are 60, 70, 80, 90, 100, 120, 140, 160, 180 yards and driver. You will go through each distance six times. The test will provide you with a score from 0-100 based off of the carry distance and the distance from the center line for each of the yardages. You will create and input your information into your personal TrackMan profile. Once the session is completed, these results will be uploaded to MyTrackman.com where they can be analyzed. The report will provide you with detailed information of all the shots taken and what the average yardage and accuracy is for each shot. It will also give you an estimated handicap based on your performance on the combine. The TrackMan Combine test will help you get a better idea of what yardages you need to work on within your game. Whether that be dialing your wedges, mid to long irons, or working on your accuracy with your driver, the TrackMan Combine is a great way to challenge yourself and put in some work getting ready towards the upcoming season. Having the ability to have access to the on-line information during the middle of your season will allow you to review or tune your game to ensure you have the all the right yardages. This week’s Course of The Week features the home of the Hero World Challenge hosted by Tiger Woods, Albany CC. Site of Jon Rahm’s 2nd PGA Tour victory, this par 72 Ernie Els design course is a desert style-links golf course in The Bahamas. The fairways are a traditional open and rolling links design, offering opportunity for players and weekend warriors alike to hit the fairway. You will need to navigate sand off the tee, however the fairways are not the hardest part of this golf course. Missing the greens here is not something this golf course will be forgiving about. With pothole bunkers, extreme drop offs, and desert fescue, hitting your most accurate iron in to greens will be your best opportunity to make par. Since missing on the correct side is important on this course, use the TrackMan hole layout to see exactly where you don’t want to slice or pull-hook it. While we can’t recreate the beautiful weather of The Bahamas here at Pure Drive Golf, we do offer the opportunity to play one of the Caribbean’s finest golf courses. Be sure to reserve your simulator rental today and play Albany CC, a beautiful track with challenges for all levels of players. The Winter Golf League Begins! Welcome to the 2019 Pure Drive Winter Golf League! The Pure Drive staff is incredibly excited to kick-off the virtual golf season. Our goal is to provide a competitive but fun, social setting to learn and allow our participants to hopefully make some new golfing friends along the way. In keeping with that motto, we sincerely appreciate the support of our returning players and look forward to our new golfers' participation in the league. We have a total of 31 teams, spanning all age groups and skill levels, that are fired up to knock off our Fall League Champs, Rich and Steve Modliszewski, who are back to defend their title. As of now, the total purse for the League is $1,500. Payouts are as follows: 1st Place - $750; 2nd Place - $275; 3rd Place - $225; and 4th Place - $150. The entire Pure Drive staff is here to assist you in any way possible, so please feel free reach out if you have any questions or concerns. We're looking forward to a great Winter League! Introducing a new series called TrackMan Course of The Week! 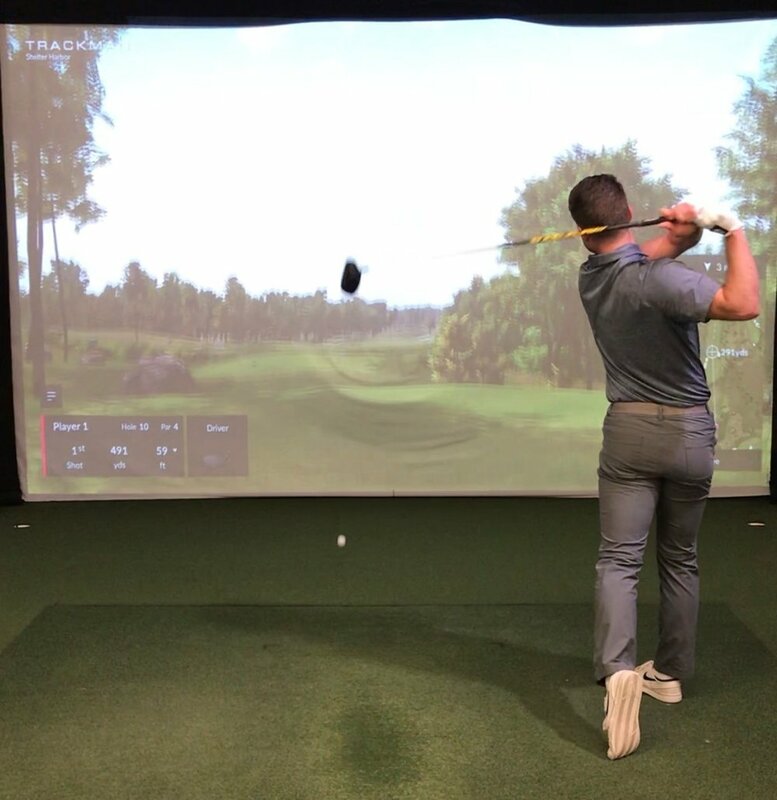 Here at Pure Drive Golf, we provide the opportunity to play some of the best golf courses you can play via TrackMan during your simulation rental. Every week we will feature one of the many golf courses that you can play on TrackMan, right in our facility. This week features the Sea Island Plantation and Seaside courses located on the coast of Georgia. These beautiful golf courses are the home of the PGA Tour’s RSM Classic, a tournament hosted by Davis Love III and where this season Charles Howell III captured his 3rd PGA Tour win. The Plantation course features open, playable fairways with incredible forest views. Players will find they often have a look at the hole from most parts of the fairways, enticing all level of players to either attack the pin or safely go for the green. Seaside course was developed on Georgia’s natural coastline, providing a natural ocean-links style layout that plays true to its style. Fairways lined with dunes and bunkers provide challenging, yet approachable opportunities for players off the tee. This Tom Fazio re-design course speaks for itself, offering some of the best views golf has to offer. Whether you play the parkland style Plantation course with scenic forest views, or the ocean-links style Seaside course featuring Georgia’s stunning coast line, these courses are perfect for play for all levels of golfers. Book your simulator reservation online today to play these amazing courses at Pure Drive Golf. The weather maybe cold and dreary but that doesn't mean your golf game needs to suffer. At Pure Drive, golf is always in season. As the leading indoor golf facility in the area, we offer something for everyone. Each one of our 5 bays is equipped with Trackman technology, the most advanced and trusted launched monitor in golf. Whether you are a single player looking to improve your game or a foursome out for a little healthy competition, we have you covered. Pure Drive Golf owner and Director of Instruction, Adam Kolloff @akolloff, is featured in the February Golf Digest! His article offers advice on putting on slow, bumpy greens. Aomng other things, he mentioned two setup keys such as playing the ball position forward with the hands forward. This will help optimize forward roll to prevent coming up short. Don’t forget to get a copy and check it out! Adam was also voted by Golf Digest as one of America’s Best Young Teachers, which was featured in the November 2018 Golf Digest. This was Adam’s second time being selected on this list.